Even without the inevitable Human intrusion, Stanton would have been an anomaly. Boasting a wide green zone with four inhabitable superearths, the system is, from a cosmological perspective, unusual. Strictly speaking, star systems as purely inhabitable as Stanton simply don’t exist. The combination of the proper star type with the evolution of four especially large Human-suitable biospheres requiring limited terraforming is so unlikely as to strongly suggest design. Meanwhile, the divergent ecologies on Stanton’s four worlds are of significant interest to scientists of all stripes. No one is sure exactly who first settled the Stanton system. All indications are that it was discovered by a free agent trader and that word of the location and its potential riches spread slowly on the electronic grapevine. By the time the UEE noticed the system’s existence, all four planets had populations numbering in the tens of thousands. That notice spelled their doom. A quartet of superearths are an extremely rare find and the Empire quickly declared Stanton to be a case of eminent domain, citing a need to protect and extend nearby jump lanes. Without formal colonization papers on file, the existing inhabitants had little choice: prospectors, survivalists and other squatters have little means to protect themselves from the might of a Bengal-class carrier. The Empire was then stymied. As is often the case, wanting was a great deal more interesting than having. With a down economy in the midst of a hundred-year colonization drought, the UEE had few options for actually exploiting Stanton. UEE naval engineers conducted the small amount of required terraforming, a series of underfunded military outposts were established, and then Stanton sat unwatched for another generation. The decision was ultimately made to sell the system piecemeal to the highest bidders. Megacorporations were quietly contacted and asked to bid for their own planets. The winners are believed to have flushed trillions into the UEE economy: MicroTech, Hurston Dynamics, ArcCorp and Crusader Industries. In a remarkable lack of originality, the four worlds are now named MicroTech, Hurston, ArcCorp and Crusader. however, the system has become fully corporatized and the initial settlers have been (often literally) driven underground. The superearths are now dotted with factories, corporate headquarters, testing ranges, mining facilities and other company facilities. Only those working for the corporations (or anyone leasing their space) come to live in the Stanton system, inhabiting orderly company towns. Today, Stanton is a great place to travel if you’re interested in the materials produced by several of the galaxy’s most successful corporations … or if you think you can make a profit shipping these companies the goods they need to keep working. Stanton I, home to the MicroTech corporation, is a large and generally cold planet. The temperature is the result of an error during the UEE terraforming process, which lead to unusually dense cloud production. MicroTech produces MobiGlas here, a now-standard piece of digital assistive technology used by nearly anyone traveling off-world. Although MobiGlas has become ubiquitous, MicroTech specializes in all forms of electronics, including those found in ship systems. This world is a good place to start looking for advanced sensor technologies which could provide an edge while dogfighting. Space on the world is leased to smaller companies, including some of MicroTech’s competitors … probably because it allows the corporation to keep a close eye on them. Buyouts among successful Stanton I-based startups are common. Visitors are advised to seek work and cargo news at Wally’s Bar; just don’t ask for Wally. Stanton II is home to Hurston Dynamics, an aristocratic family-run weapons manufacturing concern which has bled the world dry. Stanton II’s ecosphere has been largely destroyed, with almost all indigenous life killed by the mining and manufacturing processes here. Hurston builds several lines of reliable weapons, and pilots looking for specialized guns might do well to visit here. The planet also produces a variety of munitions which are sold to other companies, and transport assistance is always well compensated. Workers are imported for year-long factory or mining contracts; few choose to re-up. Stanton is always in need of cheap labor and is a good source for traders looking to move antimatter precursors. ArcCorp, Stanton III, is the most visually impressive of the worlds today. While the other planets, even polluted Hurston Dynamics, retain some indication of their natural origins, ArcCorp is now an entirely constructed world. All of the terrain has been sculpted, zoned and built upon, leaving nothing for nature. ArcCorp builds fusion engines in bulk, using the underground resources on Stanton III to provide engines for hundreds of thousands of civilian spacecraft every year. Traders porting at ArcCorp are advised that in addition to deals on weapons, they can find just about anything else here. ArcCorp is absolutely indiscriminate about who they lease property to, and hundreds of other smaller companies have made their home near the world’s north polar region. Anthropologists familiar with the Xi’An have posited that ArcCorp is the closest human equivalent to a Xi’An factory world, and many have drawn the conclusion that our civilization will someday evolve along the same lines. Stanton IV is Crusader, called “Cl” by the natives; it is an unusual world. Formed midway between a telluric world and a gas giant, Crusader’s small rocky core is enshrouded in an especially deep low-density atmosphere. Initial UEE terraforming efforts failed to allow unfettered habitation of the planet itself, but rendered the atmosphere breathable at high altitudes. The planet then became home to a military-constructed latticework of inhabitable floating platforms, since expanded exponentially to suit the needs of Crusader Industries. The situation is unusual, but ideal for Crusader, which makes large-scale commercial transport ships which would otherwise need to be built beyond the atmosphere. Being built in open air allows the cost of these ships to be reduced by almost 40% on the back end, which is often passed along to consumers. 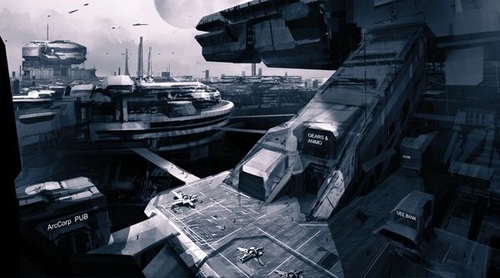 The company also provides quality housing for their employees — both in planetside domes and in habitats woven into the latticework — and the portion of the world available to visitors is usually considered the nicest port in the system. The shipyards themselves are eerily beautiful, with huge transport ships suspended in mid-atmosphere surrounded by a lighted webbing of Crusader facilities. TRAVEL WARNING Visitors should note that while the standard United Empire of Earth penal code technically applies in the Stanton System, the UEE does not police the region. Private squadrons and hired mercenaries belonging to the inhabiting supercorporations enforce their own laws here.